« Feelin’ the composting love! Let’s take a moment to talk about : forks! All of your comments have had me thinking about composting of all kinds lately, and I am working on a longer post about indoor worm bins. But in the meantime, I ask you to consider the fork. I was thinking about it this morning precisely because neither of my children care to use them. Spoons are cool, but forks? Not interested (granted, they are 5 and 8). We make a point of sitting down at the table for almost every meal (eating is important to us, after all) and no matter what cutlery is made available to them, they just want to dig in with a spoon or – better yet – their hands. When we asked them recently what they have against forks, my oldest responded by questioning why forks are even necessary. Of course, we all know the obvious answer to that, but as it turns out, Medieval Venetians felt exactly the same way! Forks are a relative newcomer to the table and you can read about their fascinating history in the recent Apartment Therapy Retrospect column, “Fork This: A Quick History of Forks” by Anna Hoffman. Her regular column on design history is my favorite part of AT, so if you are not already familiar, check it out. And if you are a regular AT reader, what do you think of the new design? Personally, I’m glad they streamlined it and so far am a fan. Now, back to the decomposition of vegetable matter. Happy Weekend! This entry was posted on January 14, 2012, 4:47 pm and is filed under Uncategorized. You can follow any responses to this entry through RSS 2.0. You can leave a response, or trackback from your own site. I always knew I wasn’t alone in preferring spoons! Give me a good spoon and bowl over any other utensils and food holders any day! 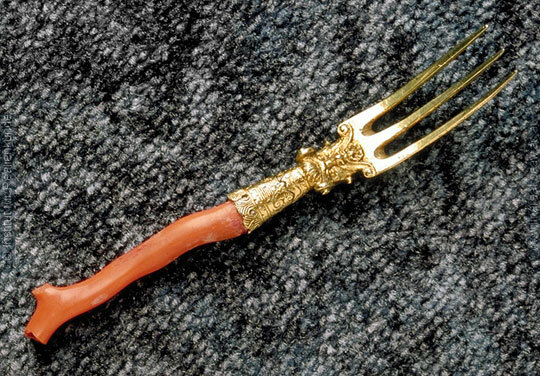 That gold and coral fork is a lot prettier than my collection of plastic multi-colored kiddie-forks (and spoons). Now that I think of it, the girls never liked those so much, did they?